What is verification in software testing ? During verification process in software testing we mainly check that whether or not all the requirements are listed properly. Generally verification process is applicable on the early stages of the SDLC. Verification is a kind of manual testing such as Verification of SRS and SDD. 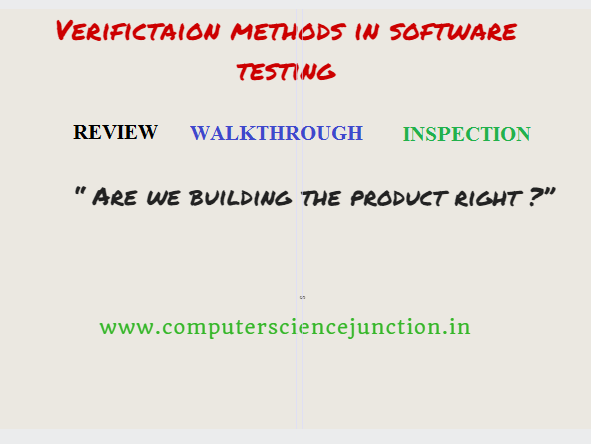 Verification methods in software testing are the techniques which are used to verify the documentation of the software and also for source code review. The major objective of these software verification methods is to review the document with the purpose of finding the errors. Many methods are commonly used in practice such as review, walkthrough and inspection. Verification process helps in prevention of the potential faults which may lead the failure of the software. Review or some time known as technical review in software testing is the simplest method of software verification to find out the fault during the verification. In this method of verification we give the document or program to the someone else and ask him to review the document. Review may vary from formal to informal. Formal review is well structured and regulated. Informal review is not well structured and applied at various times during early stages of the life cycle of the document. A team of two person can conduct the informal review. Here we expect views from the reviewer about the quality of the document and also expect finding the faults. This process gives the good result without spending the significant resource. Generally it generally involve the SRS verification, SDD verification and Program verification. During technical review in software testing the reviewer may prepare a report of his observation or sometime may verbally inform during discussion. Reviewer should have the domain knowledge , good skills. walkthrough in software testing is more formal and systematic method than review. I this method of verification author of the document presents the documents to a small group of two or seven person and this document is distributed to all the participants. During the meeting author introduce the material in order to make them familiar with it. All participants are free to ask the questions . All the participants write their observation on any display mechanism like board , sheet, projector etc. So that every one may see and give views. After this author write a report about findings and any faults pointed out in the meeting. Some major benefits of using walkthrough in software testing are less debugging or error correcting costs, and walkthrough is a most effective method in finding from 30 to 70 percent of the logic-design and coding errors in typical programs. They are not effective, however, in detecting high-level design errors, such as errors made in the requirements-analysis process. Code inspection in software testing is more formal and well structured method of verification. Here the presentator is not the author but some other person who prepare and understand the document being presented. The document is distributed to all participants in advance in order to give them sufficient time for preparation. Rules for meeting are fixed and communicated to all the participants. During code inspection every person in the meeting participate openly and follow the rules. The moderator or a senior person conduct such meeting and respect every one views. Some time a checklist is also used to review the document. After the meeting a report is prepared by the moderator and circulated to all the participants. They may give their view again. A final report is prepared after incorporating the necessary suggestion by the moderator. Inspection verification method is generally used when we perform the verification of the code. When we use the term code inspection the code inspection is generally can be defined as a set of procedures and error-detection methods use for group code reading. In the code inspection meeting overall discussion focus on the procedures and the forms to be filled out and we give a after a short summary some general procedures and we concentrates on the error detection techniques. An inspection team usually consists of four people. One of the four people plays the role of moderator. Some responsibilities of the moderator are distributing the material among the team member and making the schedule for inspection activities and inspection session, Moderator Leads the session and moderator also records all errors found and ensure that the errors are corrected. I hope that this verification methods in software testing based tutorial will be helpful to you in understanding the concept of verification and verification techniques in software testing.